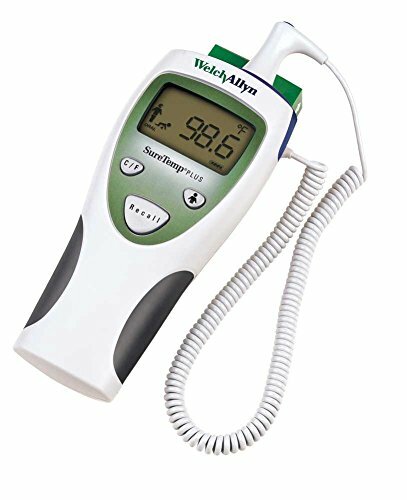 Welch Allyn SureTemp Plus 690 Thermometer with Oral Probe by Welch Allyn at Muscle Pain Relief Rubs. MPN: 932279. Hurry! Limited time offer. Offer valid only while supplies last. WelchAllyn SureTemp Plus 690 Electronic Thermometers provide fast, 4-second oral, 10-second pediatric and 15-second adult axillary temperatures. WelchAllyn SureTemp Plus 690 Electronic Thermometers provide fast, 4-second oral, 10-second pediatric and 15-second adult axillary temperatures. Monitor-mode capability for measuring 3-5 minute temperatures. Used probe covers can be ejected automatically. Easy-to-read LCD displays temperature in Fahrenheit or Celsius from 80 degrees F to 110 degrees F patient range and 50 degrees F to 104 degrees F ambient range. Recalls last temperature. Model 690 features waterproof, stainless steel probe shaft and convenient storage housing for 25 probe covers. Takes about 6,000 readings on three AA batteries. Specifications: Battery life and on-screen location ID indicators Ergonomic, rubberized hand grips improve ease of handling 3.18"W x 8.46"H x 2.43"D Three year limited warranty, one-year limited probe warrany 12-3/5 oz.